WWE Money in the Bank: The world famous sports, the World Wrestling Entertainment (WWE) have various types of events in Men and Women. In that, the money in the bank is one which have huge fans across the world. Check the important things which you need to know about this event. On Sunday, the WWE has scheduled the Money in the Bank on June 18th at Scottrade Center in Saint Louis. The Money in the Bank set to begin at 8 p.m. ET. which featured by AJ Styles, Randy Orton, Jinder Mahal, Kevin Owens, Sami Zayn, Dolph Ziggler. There is totally six Match cards of this WWE Money in the Bank. Check the complete details and match prediction here below. For the first time, the WWE fans will also be in for a treat as a women’s Money in the Bank Ladder Match will be happening. According to the schedule, the SmackDown Tag Team Championship and SmackDown Women’s Championship will also be followed on the list. This is pay-per-view event and so the matches available for £14.95 on Sky Box Office. In the SmackDown Women’s Championship, Noami will fight against Lana for the title. Also, the SmackDown Tag Team Championship match consisted for Usos vs The New Day. The Kickoff match between the Hype Bros vs. The Colons. Jinder Mahal will meet Randy Orton for the WWE Championship. Notably, Orton will compete against Mahal at his hometown. Becky Lynch vs. Charlotte Flair vs. Natalya vs. Tamina vs. Carmella (Women’s Money in the Bank Ladder Match). Kevin Owens, AJ Styles, Baron Corbin, Sami Zayn, Dolph Ziggler and Shinsuke Nakamura (Men’s Money in the Bank Ladder Match). WWE Money in the Bank Results will be updated here for all the matches. Check the prediction of all the games in the Match card. 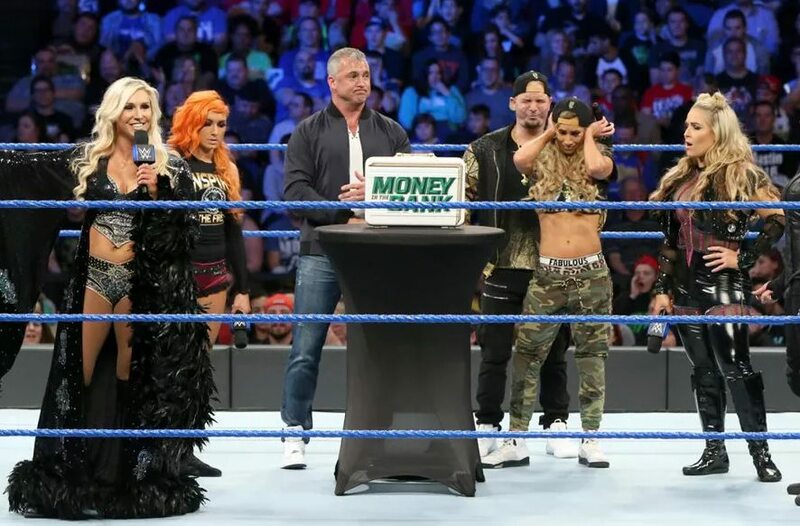 Predictions: The Hype Bros, The New Day (SmackDown Tag Team), Naomi (SmackDown Women’s Championship), Carmella (Money in the Bank), Baron Corbin (Money in The Bank), and Jinder Mahal (WWE Championship) may all win this MONEY IN THE BANK.